Speaking on International Day for the Elimination of Violence Against Women, President Macron unveiled plans to enact stricter laws and improve police support for victims. "It is time for shame to change camps," he said. French President Emmanuel Macron announced new initiatives on Saturday aimed at addressing harassment and violence against women in France, noting that he hopes to erase the sense of shame amongst victims. In a speech marking the International Day for the Elimination of Violence Against Women, Macron laid out a plan to improve gender equality and rethink sexual politics. A total of 123 women were killed by their partner or ex-partner in 2016 in France, he said. Another 225,000 women were physically or sexually abused by their partners, but only 20 percent of the cases were reported to authorities. "It is time for shame to change camps," he said after holding a minute of silence for the victims. According to the Organization for Economic Cooperation and Development (OECD), a distrust of police leads to victims not reporting their assaults. 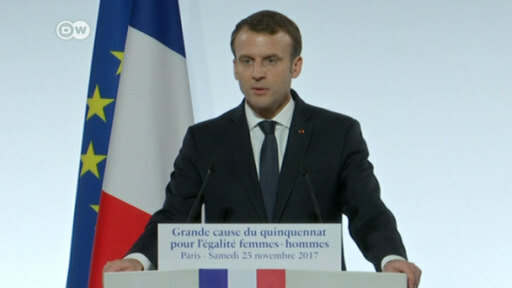 In his speech, Macron proposed a ream of initiatives that could be included in a draft law in 2018 to address violence against women and provide more support for victims. Macron also pledged to increase the budget of France's gender equality ministry by 13 percent and make an extra €420 million ($501 million) available to aid equality initiatives. "Let's seal a pact of equality between men and women," Macron said in his speech. Osez le Feminisme, a French feminist group, said that the president's new measures were on the right path, but that funding will be key to their success. "Without funding, any communication, training, awareness or help plan for the victims will be useless," the group said in a statement. The Harvey Weinstein scandal in the United States and a decade of sexual harassment scandals in French politics has prompted a national rethink of attitudes towards sexual harassment and the country's image. France has been in an uproar this week over CCTV footage showing a man assaulting a woman in the street for standing up to his harassing cat calls. New gender equality laws hope to tackle street harassment, but reporter Jake Cigainero in Paris tells us some are skeptical it will help. In a speech marking the International Day for the Elimination of Violence Against Women, French President Emmanuel Macron laid out a plan to encourage women to take action, strengthen laws against offenders and educating citizens on the issue.